Sen. Fasano also spoke to the group about bipartisan efforts in Connecticut to craft legislation that supports students, including Hispanic students, working towards earning a college degree if they are on a path to citizenship. Senator Fasano was joined by (pictured left to right) Ingrid Alvarez-DiMarzo, Connecticut State Director of the Hispanic Federation of CT; Maria Campos-Harlow, Executive Director Spanish Community of Wallingford; Jonathan Gonzalez-Cruz, Wallingford Resident and Policy/Legal Research Intern Connecticut Students for a Dream; Senator Gary Winfield and Senator Art Linares. 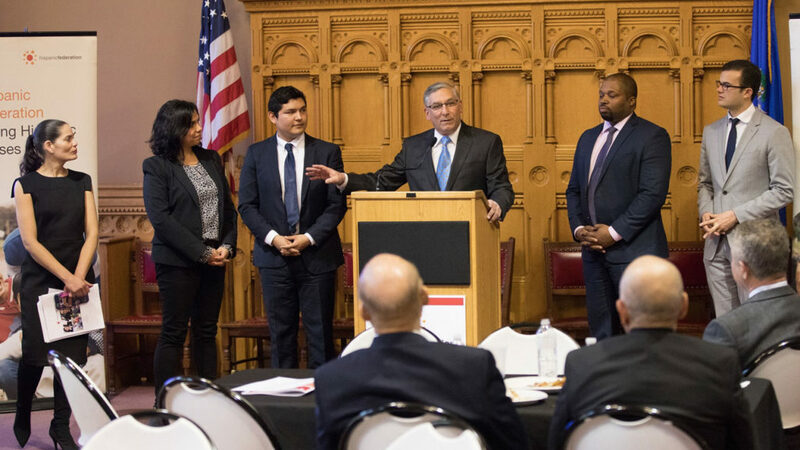 Senate Republican President Pro Tempore Len Fasano (R-North Haven) joined the Hispanic Federation for their annual Orgullo y Poder Connecticut Advocacy Day and Legislative Luncheon on March 26, 2018. Each year, community and government leaders gather at the State Capitol to discuss issues of concern to the state’s Latino residents. Following the luncheon, advocates and leaders meet with state legislators to convey their priorities. This year, discussion included the administration’s budget cuts and holdbacks that impact Latino nonprofits that provide social service programs. Connecticut Republicans have long advocated in favor of protecting funds for Connecticut nonprofit organizations which have been shown to provide a higher quality of care at a lower cost than many state run services. Both the Republican budget and bipartisan budget that passed the legislature last year protected funding for many nonprofits, but the governor held back much of this funding. Senator Len Fasano serves as Connecticut Senate Republican President Pro Tempore. He represents the 34th Senate District including Durham, East Haven, North Haven and Wallingford. For more information visit www.senatorfasano.com.